The Young Christian Workers Movement, of which IMPACT! is a programme, is an international youth movement, which values the dignity and worth of each young person. It enables its member to challenge social exclusion and take action to bring about change in their home, workplace and social life. The YCW of Ireland is fully committed to safeguarding the well being of its members and those who work with them. Good practice contributes towards raising standards in youth work and creates a healthy and safe environment for both young people and the adults who work with them. Take care to ensure that all buildings and meeting rooms used for activities with young people are suitable, safe and secure. As Chaplains/Facilitators or YCW members working with IMPACT! groups you will be required to meet with those responsible for leading the enquiry of the week. As IMPACT! groups consist of members legally classified as children there are some specific guidelines that should be followed in relation to enquiry preparation and working with your group. You should meet with at least two members to prepare the enquiry (President/Chairperson and Enquiry Leader). Avoid situations where you are left alone with one of the members, either at meetings, in cars or during activities. It is always a good idea to have two adults present during meetings, 1 male and 1 female if possible. In any case there should be a ratio of 1 adult to every 8 young people. Physical contact of a comforting and reassuring nature is a valid way of expressing concern for children where such contact is acceptable to all persons concerned. Be aware of the possibility of physical contact being uncomfortable or inappropriate. Do not engage in sexually explicit language or behaviour or jokes of a discriminatory nature. Whilst participating in any activity with IMPACT! Members, the law of the land should be strictly adhered to and never, ever broken. As a member of staff, a Chaplain or Facilitator, or as a volunteer you may well be looked up to by the members of your group (and other members of the Movement) and treated as a role model. It is vital that you respect this position and pay due regard to setting a good example. You should not engage or condone any form of racism, sexual discrimination or discrimination of any kind. As a person in a position of “authority” you should avoid at all times the development of inappropriate relationships with members that are not wholly professional. 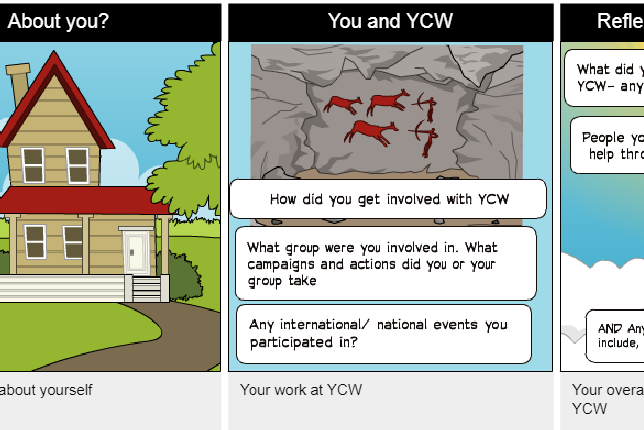 In order to protect all involved in the YCW Movement including IMPACT!, Staff and volunteer Chaplains / Facilitators are required to fill in an application form and a Garda Vetting Form prior to commencing work or sitting with groups. We ask you to understand that this is a necessary step to protect you and the young people/children you will be in contact with and not a reflection on any individual. Weekends away or residentials with your group require careful and considerate planning. You should seek written permission from parents/guardians, have appropriate numbers of adults and ensure that the privacy of the young people is respected at all times. Do not promise to keep it a secret. In line with good practice procedures YCW is mandated to implement Garda Vetting as part of our recruitment and selection procedures. You will receive a vetting invitation form which should be completed and returned to YCW along with I.D and proof of your current address. YCW as a member of the National Youth Council of Ireland’s Vetting Consortium will forward this information to NYCI who will upload it to the Garda website. You will then receive a form to complete via email from An Garda.